A range of strimmers, scrub mowers and flails designed specifically to cut grass and undergrowth on both level and steep ground, in domestic and commercial applications. 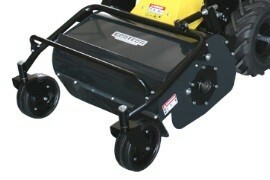 Riko UK is the UK importer for ECOTECH mowers. They offer incredible bank mowers and strimmers that can work on steep bank effortlessly thanks to a unique patented swing system. The patented Swing System means Riko Strimmers, Scrub Mowers and Flail Mowers make it possible to work on slopes and banks up to 45° with a 4-stroke engine. This system allows the cutting head to move independantly to match the angle of the slope, keeping the engine horizontal and maintaining engine lubrication. The incline is adjusted by means of a simple and convenient control, placed on the handlebars. These machines enable you to safely cut areas such as banks along rivers, lakes and reservoirs. The Riko Bank Mowers, Strimmers and Flail Mowers, are ideal for clearing and maintaining footpaths and roadside verges, or anywhere with steep slopes up to an incredible 45°! 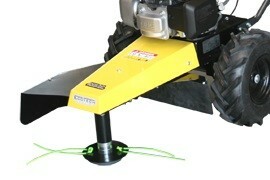 No more backache with hover mowers dangling from the end of a rope. No more struggling to stay upright with a handheld or backpack strimmer. No more abandoned area's due to weather preventing safe mowing. The cutter matches the angle of the ground so the handlenar remains vertical with the operator. The power drive & differential allows you to drive up and turn across the slope. 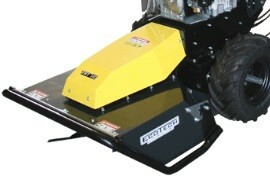 The TRT60-Swing takes on rough material, but cuts as well as a rotary mower, doing the job of 2 machines.